New counselors in the general presidency of the Sunday School are among callings announced recently by the First Presidency. Salt Lake City, Utah, attorney William D. Oswald has been called as second counselor in the general presidency of the Sunday School. Joe J. Christensen, former second counselor, has been called as first counselor. The former first counselor, B. Lloyd Poelman, has been called as a mission president. Dr. Russell M. Nelson will continue as general president. Brother Oswald, 42, was bishop of the Monument Park Second Ward in the Salt Lake Bonneville Stake. He has served on the Sunday School General Board and has been bishop and bishop’s counselor in three University of Utah wards. Other callings announced include a new president and matron of the Logan Temple and new counselors and recorder for the Sao Paulo Temple. Reed Bullen, a Utah state legislator and broadcasting executive, has been called to serve as president of the Logan Temple. Kathryn Bowen Bullen, his wife, will serve as temple matron. President and Sister Bullen succeed President and Sister Lloyd R. Hunsaker, who have served since 1973. Called as counselors to President Bullen were Oral L. Ballam and Arlin R. Pugmire, both of Logan. The Logan Temple is presently closed while undergoing major interior renovation. It is expected to be reopened in early 1979. The two new counselors in the Sao Paulo Temple presidency are Jose Benjamin Puerta, first counselor, and Angel Miguel Fernandez, second counselor to President Finn B. Paulsen. President Puerta has been president of the Sao Paulo Brazil West Stake since its creation in 1973. President Fernandez is now serving as president of the Argentina Rosario Mission. President and Mrs. Fernandez will complete their mission assignment in July. The Sao Paulo Temple will be dedicated October 30 by President Spencer W. Kimball. Three new missions﻿—in Ecuador, Japan, and California﻿—have been announced by the First Presidency. The July I organization of the new missions will increase the worldwide total to 159. Headquarters for the new missions will be Guayaquil, Ecuador; Tokyo, Japan; and Ventura, California. The Ecuador Guayaquil Mission is being formed through a division of the existing Ecuador Quito Mission. Guayaquil and Quevedo are the major cities in the mission, which includes the western portion of the country. The existing Japan Tokyo Mission will be divided into the Japan Tokyo North and Japan Tokyo South missions, both based in Tokyo. Membership in Japan exceeds 30,000. A division of the existing California Los Angeles Mission will form a new mission to include San Luis Obispo, Santa Barbara, and Ventura counties, and the northern part of Los Angeles County. Santa Monica will remain in the Los Angeles mission. Downey, Cerritos, Huntington Park, and Whittier will be added to the Los Angeles Mission. Boundaries for the new Jordan River Temple District and the Salt Lake Temple District have been announced. Forty-nine stakes in the northern half of Salt Lake County and southern Davis County in Utah are assigned to the Salt Lake Temple District. 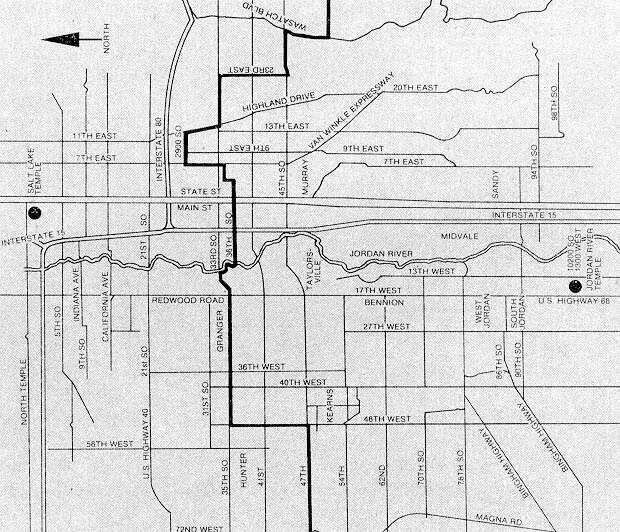 Fifty stakes in southern Salt Lake County are in the Jordan River Temple District. Those living in the two districts have been invited to contribute to the Jordan River Temple fund. The site for the temple, at 10211 South 1300 West, Midvale, was a gift to the Church from Mr. and Mrs. Alma Holt of South Jordan, in behalf of themselves and Brother Holt’s sisters.